As we have already discussed about the general concepts related to Class, Objects, Inheritance etc, using an example in the previous tutorial. In this tutorial, we will elaborate more on these topics. Identity: Identity refers to some piece of information that can be used to identify the object of a class. It can be the name of the student, the company name of the car, etc. Properties: The attributes of that object are called properties. Like age, gender, DOB for a student; or type of engine, number of gears for a car. Behaviour: Behaviour of any object is equivalent to the functions that it can perform. In OOP it is possible to assign some functions to objects of a class. Taking the example forward, like a student can read/write, the car can accelerate and so on. A class is a blueprint where attributes and behaviour is defined. For example, if Mahatma Gandhi, Sachin Tendulkar, you and me are objects, then Human Being is a class. An object is the fundamental concept of OOP but classes provide an ability to define similar type of objects. In class, both data, and the functions that will be operating on that data are bundled as a unit. For example, let's say there is a class named Car, which has some basic data like - name, model, brand, date of manufacture, engine etc, and some functions like turn the engine on, apply brakes, accelerate, change gear, blow horn etc. 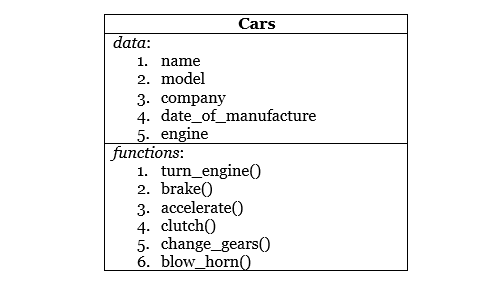 Now that all the basic features are defined in our class Car, we can create its objects by setting values for properties name, model etc, and the object of the class Car will be able to use the functions defined in it. Data hiding helps us to define the privacy of data from the outside world or to be precise, from other classes. The reason behind doing this is to create several levels of accessing an object's data and prevent it from accidental modification. Also, hiding, or setting up privacy levels, can be done for functions as well. In OOP, data inside the classes can be defined as public, private or protected. Private data or function are the ones that cannot be accessed or seen from outside the class whereas, public data or functions can be accessed from anywhere. Protected data or functions, more or less act like public but should not be accessed from outside. Classes use the concept of abstraction. A class encapsulates the relevant data and functions that operate on data by hiding the complex implementation details from the user. The user needs to focus on what a class does rather than how it does. Encapsulation, is one of the core reason for the existence of an object. Since the beginning we have been talking about objects, its data, functions, privacy etc., now it's time to know how is all this kept bounded. The answer is encapsulation. Much as it may sound like a capsule, it is pretty much the same. Here we try to encapsulate the data and functions together which belongs to the same class. As explained in the previous tutorial, inheritance is about defining a set of core properties and functions in one place and then re-using them by inheriting the class in which they are defined. Python supports Simple, Multiple and MultiLevel Inheritance. We will be covering these in details in inheritance tutorial. Polymorphism, or Poly + Morph, means "many formsb. Precisely, Polymorphism is the property of any function or operator that can behave differently depending upon the input that they are fed with. The above add function will always take 2 numbers as input, but what if you want to add 3 numbers at once or maybe 4 numbers. Hence, in OOP you can simply define the function add once again, this time with 3 parameters, and this mechanism is known as Function Overloading. Now we can call add() function with two, three or four parameters. As you can see here, function add() now has multiple forms. Gives you output "helloworld". We can see here, how + operator when used with numbers performs mathematical addition operation but when used with strings it performs concatenation. it gives, "hellohellohello". This is yet another example of operator overloading.